What a difference a year of high school can make — for long-term health. In 1972, England, Scotland and Wales raised the mandatory school attendance age from 15 to 16. Through a large-scale genetic study, USC Dornsife researchers have found that decades later, the change had a health benefit for those students affected by the reform, especially those who were at greatest risk of becoming obese. The extra year of education contributed to weight loss, despite their genetic risk, the research team found. "This means that genes alone do not determine who will become obese," said Silvia H. Barcellos, a research scientist at USC Dornsife's Center for Economic and Social Research (CESR). "In fact in this case, one more year of high school lowered the influence of genes on whether someone becomes obese." 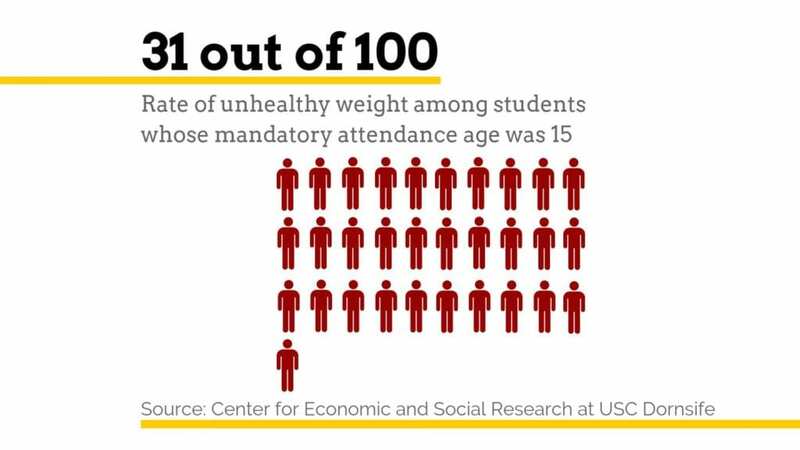 Before the mandatory attendance age was changed, 31 out of every 100 people with the highest genetic-risk had an unhealthy body size. After the reform, the rate dropped to 18 out of every 100. Among those with the lowest risk, the rate remained roughly unchanged. The latest findings were published Tuesday by the journal Proceedings of the National Academy of Sciences. The study is the latest in a series by the USC Dornsife CESR researchers that examines how the 1972 change in the mandatory school attendance age has affected other life outcomes for the affected students, such as whether they went to college or completed advance degrees, what incomes they earned and their socioeconomic status. For this study, USC Dornsife researchers studied the genomes of 250,000 people in the UK Biobank. The researchers looked at three health indicators: lung function, blood pressure and a "body size index." This index accounted for BMI (body mass index), body fat percentage and waist-to-hip ratio as comprehensive indicators for healthy and unhealthy weight. The scientists combined the health information with polygenic scores — a tool that accounts for variation across a person's entire genome — to determine how much influence genetics and education may have on health. The ever-expanding genetic databases that millions of people have used for checking their genealogy and their genetic risks for disease have become a resource for large-scale genetics studies. Scientists permitted to use the data have been able to identify the genetic variants linked to specific diseases such as breast cancer, disorders such as autism and even educational attainment. "Our results challenge the notion of genetic determinism. They suggest education reduced the role genes played in determining who became obese. Now, we are left with the question of why we observe larger health improvements for those with a higher genetic predisposition to obesity," said Leandro Carvalho, a co-author and research economist at CESR. Three years ago, England adopted a mandate that students must stay in school or training until they turn 18. Those students, like the cohort born in 1957, could experience health benefits as a result of the change. Patrick Turley of the Massachusetts General Hospital was also a co-author for the study. Funding for the study came from several sources, including a portion of a five-year National Institute on Aging grant K01AG050811 of $638,955, and a portion of a second NIA grant 3P30AG024962-13S1, which is a one-year grant of $360,797. Funding also came from the National Institute of Mental Health through a portion of a five-year grant, RF1AG055654, of $4.2 million. Other support came from the Ragnar Söderberg Foundation, the Open Philanthropy Project, and the Pershing Square Fund for Research on the Foundations of Human Behavior.